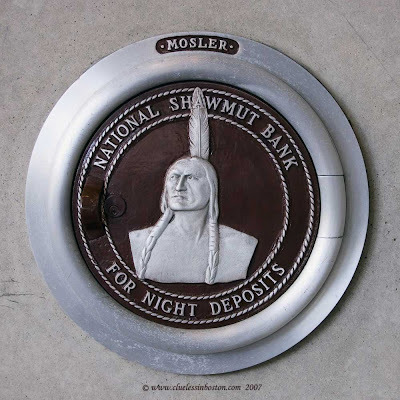 Here is another Mosler night depository drop box. Click here for my earlier post with information about the Mosler company. What an attractive deposit slot - it is most artistic. Although that guy might just scare me away on a dark night!!! Thank you for your lovely comments - it is people like you that keep me going when all i want to do is throw the computer into the sea!!! Most appreciated my friend!! Great series! Interesting & unseen parts of Boston. That shot really caught my eye. Good to see two friends here - Jules and NorthBayphoto.